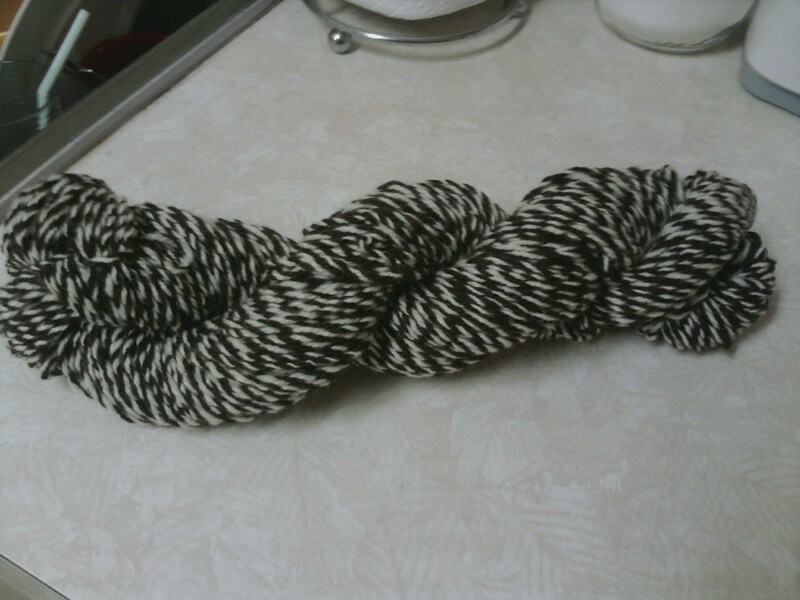 BarknKnit: My first attempt at Cabled yarn. My first attempt at Cabled yarn. This past week has been full of plying yarn and re-plying and adding twist and so on! I have taken a bunch of pictures so we'll do this with pictures! :) For starters, what is Cabled Yarn. 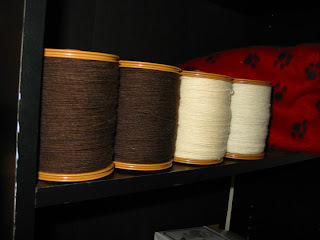 The definition I got from this site is as follows: "A cabled yarn is simply a plied yarn that is plied back on itself. In its most basic form, a cable yarn is 2 - 2 ply yarns which are then plied together." There is more details about how this is accomplished on the site referenced but I will tell you how I did it. We'll start with talking about the singles. 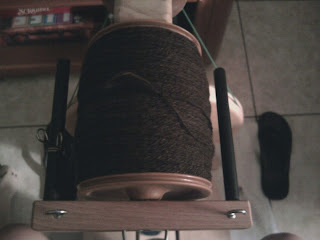 I first spun up two singles of brown Merino clockwise or with a Z twist. Which by the definition found on this site means "This is twist that is inserted into the fibers when the drive wheel is spinning to the right or clockwise" To view a picture of detailing this click here. I then over twisted it by running it back through the wheel clockwise to make sure there was lots of twist. This is requires when it comes to cable plying yarn. I also spun up a single of white Cormo and a single of white Corriedale. After making sure these have plenty of twist, I plied together the two brown singles the opposite direction, counter clockwise or S twist and plied the two white singles together as well. The S twist is the opposite of the Z twist where when the twist is added to the fibers when the drive wheel is spinning to the left or counter clockwise. We will call these the original plies. I figured since I was over-plying them that I would not have to run them back through the wheel, so I started plying a white with a brown ply clockwise on my wheel...ummm...boy was I WRONG! So, after a good conversation with my spinning mentor/adviser/friend Jasmin from the Knitmore Girls podcast, we decided that I now have several yards of pretty yarn to show off but I need to run what's left of the original plies back through the wheel before plying the rest together. 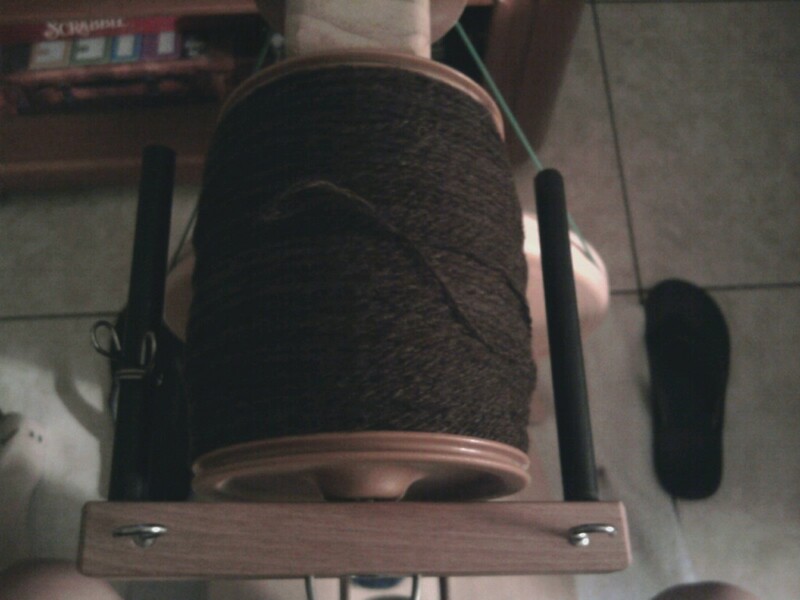 So...back to plying I went. I ran a bobbin of each of the original plies back through and added twist...again we are plying counter clockwise to add twist to the original plies. After making sure these had plenty of twist, I started back plying the original plies clockwise for the final cabled yarn. This was much more productive!! I finished plying the two bobbins of original plies last night and am VERY happy with the results. 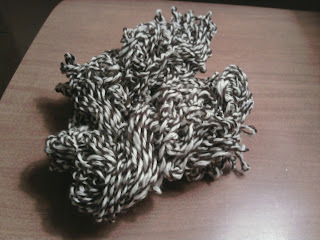 So, far with the two skeins I set the twist last night, I have about 250 yards of worsted weight cabled yarn! I was originally hoping to be done with all the plying before heading off this weekend to the Florida Fiber In with Manda, but I just wasn't able to finish. So, I'm bringing all my bobbins, some singles left to ply, and the other original plies with me so I can finish the rest of the yarn. I am really hoping to have about 600 yards when I'm done so I can make the Lady Kina with this yarn but we'll see. I'll let you know after the weekend. Speaking of weekend, Manda and I are leaving to Orlando as soon as I get of work on Friday and we'll be in Orlando at the Florida Fiber In until Sunday! I'm looking forward to meeting new people, and all the fibery goodness in store for us this weekend! I plan to get lots of pictures and some audio to share! So, look forward to that! Have a great weekend! Happy Spinning and Fibery Fun! It looks good! I like all your pretty handspun! Whew, sounds like a lot of work, but your finished yarn is just gorgeous! !